The C4 perennial grass Miscanthus giganteus has proved to be a promising bio-energy crop. However, the biomass recalcitrance is a major challenge in biofuel production. Effective pretreatment is necessary for achieving a high efficiency in converting the crop to fermentable sugars, and subsequently biofuels and other valued products. Miscanthus lutarioriparious was pretreated with a liquid hot water (LHW) reactor. Between the pretreatment severity (PS) of 2.56-4.71, the solid recovery was reduced; cellulose recovery remained nearly unchanged; and the Klason lignin content was slightly increased which was mainly due to the dissolving of hemicellulose and the production of a small amount of pseudo-lignin. The result shows that a LHW PS of 4.71 could completely degrade the hemicellulose in Miscanthus. 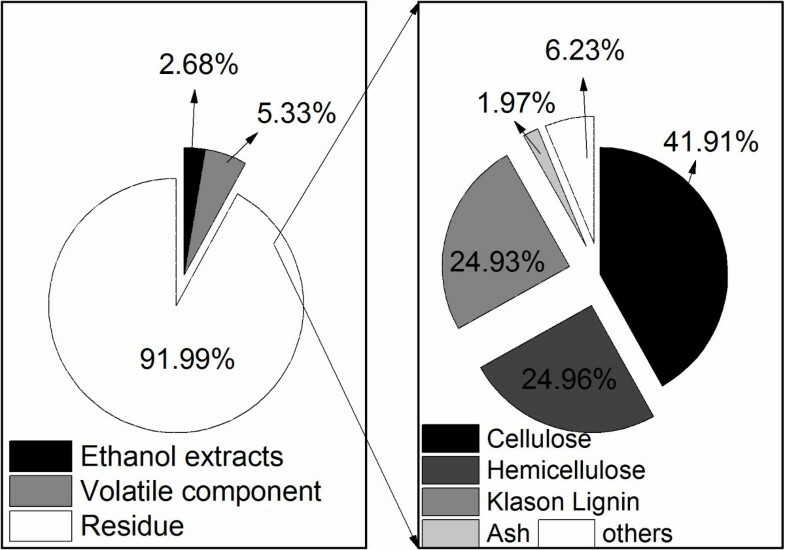 Hemicellulose removal dislodged the enzymatic barrier of cellulose, and the ethanol conversion of 98.27% was obtained. Our study demonstrated that LHW served as an effective pretreatment in case that Miscanthus lutarioriparious was used for ethanol production by simultaneous saccharification and fermentation. The combination and the pretreatment method of Miscanthus feedstock holds a great potential for biofuel production. As a C4 perennial plant characterized with high biomass yield and relatively low nitrogen and water requirement, Miscanthus is considered to be one of the top candidates of second-generation energy crops [1, 2]. The previous study showed that carbohydrates in Miscanthus giganteus constituted approximately 75% of its dry matter content . Recently, some investigations have been published on the pretreatment and enzymatic hydrolysis of Miscanthus. The treatments employed included ammonia fiber expansion (AFEX) , NaOH pretreatment , organic acid , organosolv , wet explosion  and liquid hot water (LHW) pretreatment . To improve the rate of enzyme hydrolysis and increase yields of fermentable sugars from carbohydrates, all kinds of pretreatment methods, such as dilute acid [9, 10], steam explosion [11–14], lime , wet oxidation [7, 16], AFEX [17–19], alkali [20–25], SPORL [26, 27], organosol , microwave [28, 29], ozone and LHW [30–32] have been developed. LHW pretreatment uses water as the thermal medium. Compared to other technologies, LHW pretreatment has the following advantages: no extra chemicals added, no special non-corrosive materials requirement for reactor building, and fewer toxic degradation products formed . It was considered as an environmentally friendly method, and has now become an attractive process for lignocellulosic biomass pretreatment . In addition, most of the investigations on Miscanthus merely evaluated the pretreatment effects on its enzymatic hydrolysis, with only a few on ethanol production . The ultimate objective of the pretreatment is to convert biomass into the final products such as ethanol or butanol. Because some fermentation inhibitors toxic to the microorganisms might be formed in the pretreatment , a good enzymatic digestibility does not mean that the fermentable sugars generated by the enzymatic hydrolysis can be smoothly converted to ethanol. Simultaneous saccharification and fermentation (SSF) is a more appropriate way to evaluate the pretreatment performance . This study evaluated the feasibility and efficiency of LHW pretreatment on Miscanthus lutarioriparious, a promising energy crop in China [37, 38], for ethanol production. The harvested Miscanthus lutarioriparious contained a certain amount of soil, sand and other impurities. In order to remove these impurities, the Miscanthus lutarioriparious was washed by tap water. After washing, the suspended and precipitated part was collected separately. To investigate the influence of the pretreatment on different fraction and the subsequent bioconversion process, the two parts were subjected to LHW pretreatment and following SSF. 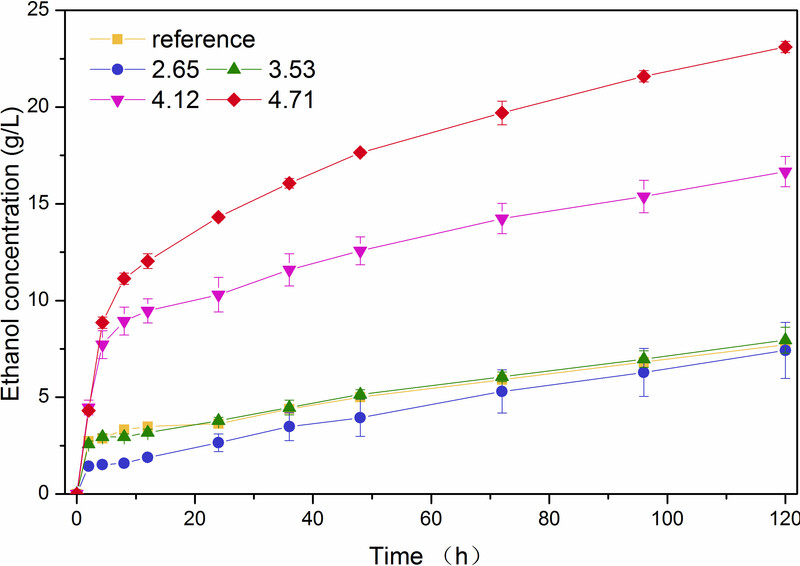 The solid recovery after LHW pretreatment, the potential inhibitors formed, and ethanol conversion from LHW-pretreated Miscanthus were investigated. In this work, the probable LHW pretreatment severity range required of Miscanthus was obtained and verified the adaptability of LHW on Miscanthus. The ethanol yield of Miscanthus was obtained and compared to other raw materials pretreated with different methods. Tap water was used to wash off the impurity in the raw Miscanthus lutarioriparious to avoid interference in the subsequent component analysis and bioconversion. After water-washing, both the suspended and precipitated parts were collected separately. Figure 1 shows the mass (dry weight) percentage of different parts of Miscanthus. 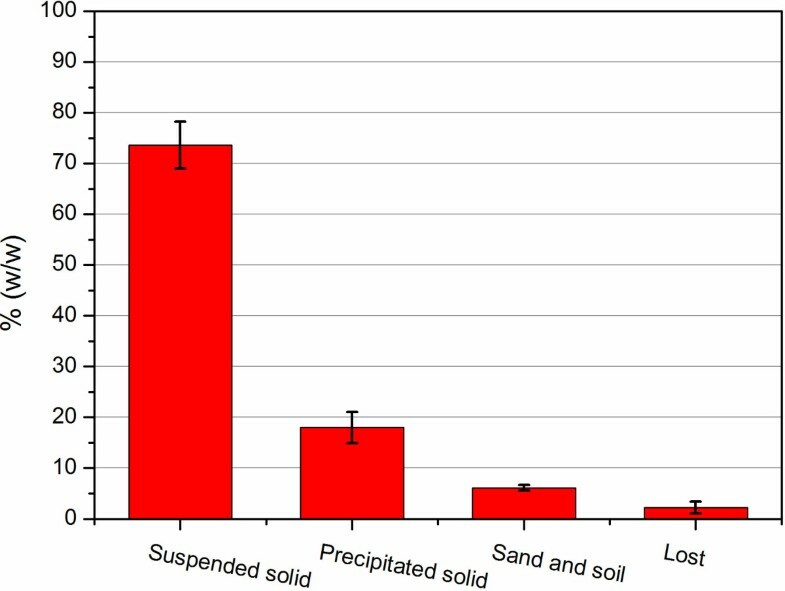 The suspended solid made up about 3/4 of the whole raw material, and the content of sand and soil was more than 5%. 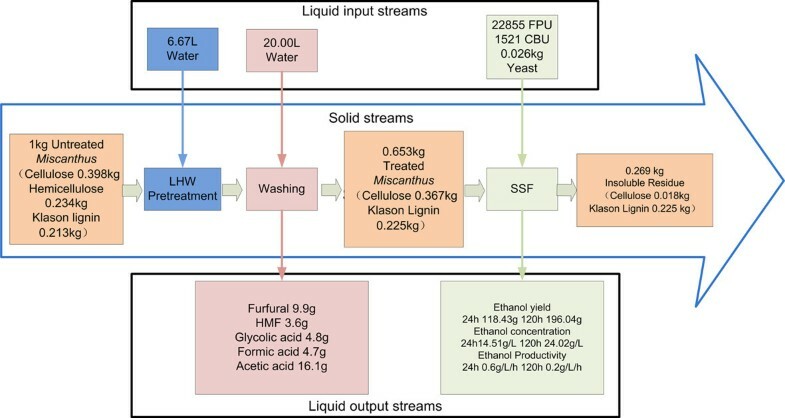 In the washing process, about 2.22% loss on the biomass and water-soluble sugars was observed, which was relatively low compared to the water-extractable ingredients in the corn stover . Mass percentage of different parts separated from Miscanthus by water-washing. Figure 2 shows the composition of the suspended solid of Miscanthus. Cellulose was the predominant component accounting for 41.2% of the residue after the ethanol extraction. The content of hemicellulose and Klason lignin was very close. The paired t-test of Minitab 16 (Minitab Inc.) software was used to compare the composition difference of suspended and precipitated solids (data not shown). The t-value was 0, and the P-value was 1, which indicated that there was no significant difference in the composition between the two solids at the significance level of 0.01. Composition of suspended solid of Miscanthus . Both the suspended and the precipitated parts were pretreated with LHW. The solid recovery (SR) at different pretreatment severity (PS) is listed in Table 1. There was a similar variation trend found for SR for both the suspended and precipitated parts. As PS increased, SR gradually reduced. For the suspended part, 95.00% of the solid were recovered at PS of 2.65. It dropped to 65.46% when PS increased to 4.71. Similarly, SR of 76.05%-64.85% was obtained for the precipitated part as PS changed from 3.53 to 4.71. The reduction of SR was mainly caused by the hydrolysis of hemicellulose in the pretreatment process which can be seen from Table 1. There was no hemicellulose found for the suspended and precipitated parts when PS was 4.71 or 4.12. This implied that submerging the Miscanthus into water completely maybe get a better LHW pretreatment effect. Furthermore, the optimal PS may be between 4.12 and 4.71. A further PS optimization may be needed. The enzymatic hydrolysis efficiency of cellulose in lignocellulosic material is influenced by many factors. The hemicellulose’s shielding effect to cellulase has been recognized as one of the key factors affecting the cellulose digestion [40–42]. The acidic environment formed under the LHW pretreatment condition contributed to the hemicellulose hydrolysis. The acetic acid produced from hemicellulose acetyl hydrolysis further promoted the hemicellulose hydrolysis . In general, a lower hemicellulose content means a higher cellulose enzymatic hydrolysis efficiency. Therefore, the removal ratio of the hemicellulose is employed as a key indicator to evaluate a pretreatment technology. Compared with the hemicellulose, the cellulose and lignin are not easily hydrolyzed in the conventional LHW pretreatment process, and they tend to remain in the solid. This caused the increase on the mass percentage of the cellulose and lignin in the pretreated biomass. In addition, some pseudo-lignin might be produced. The pseudo-lignin can be broadly defined as an aromatic material that yields a positive Klason lignin value. However, it is formed by the combination of carbohydrate and lignin degradation products, not from the native lignin. It has been reported that pseudo-lignin was produced in some pretreatment process, especially in the dilute acid pretreatment [44, 45]. In the present study with LHW pretreatment, the suspended solid had Klason lignin recovery ratios of 104.87%, 104.95 and 107.69% under PS of 2.65, 3.53 and 4.71, respectively (Table 1). In the pretreatment with higher temperature, hexose and xylose can be further degraded to 5-hydroxyl furfural (HMF) and furfural . Figure 3 shows the HMF and furfural formed in the present investigation from different PS. Obviously, both HMF and furfural yield increased as PS increased. 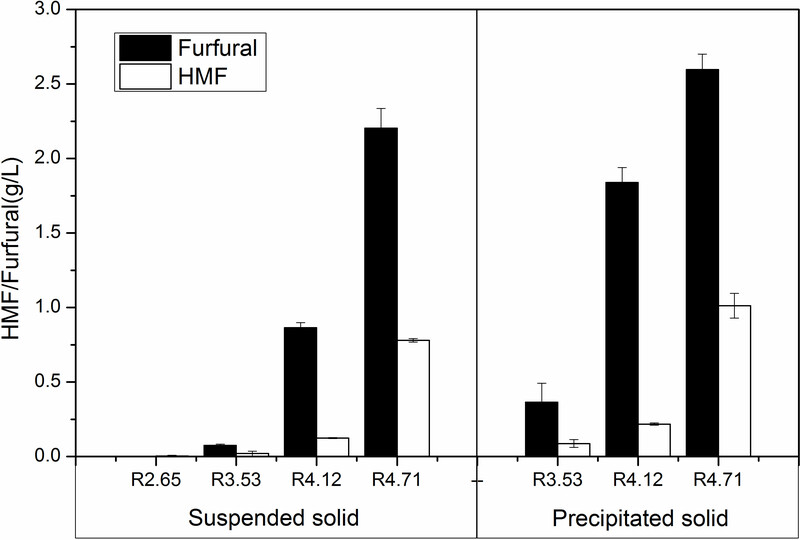 However, furfural yield was always much higher than HMF with the same pretreatment condition. For the suspended part, the furfural and HMF concentrations in the hydrolysate were 0.075 and 0.021 g/L with PS at 3.53. When PS was increased to 4.71, they were 2.2 and 0.78 g/L, respectively. Under the harshest severity of 4.71, furfural and HMF concentrations from the precipitated part were 2.6 and 1.0 g/L. If the hydrolysates are used to product ethanol, furfural and HMF in the hydrolysate will inhibit the growth of yeast and decrease ethanol yield and productivity. As volatile inhibitory compounds, furfural and HMF can be removed by heating and vaporization to alleviate the toxic effect . HMF and furfural formed in LHW pretreatment. In addition to HMF and furfural, glycolic, formic and acetic acid were also found in the pretreatment hydrolysate which is presented in Figure 4. Clearly, the formation of all these acids followed the similar trend, i.e., the concentrations increased as PS increased. During the pretreatment process, the deacetylation of acetyl groups present in the hemicellulose led to the formation of the acetic acid . The acetic acid concentration reached 3.6 and 4.0 g/L for the suspended and precipitated hydrolysates, respectively, with PS at 4.71. Formic acid can be formed when HMF is broken down . The formation of glycolic acid was due to the breakdown of glucose and xylose . 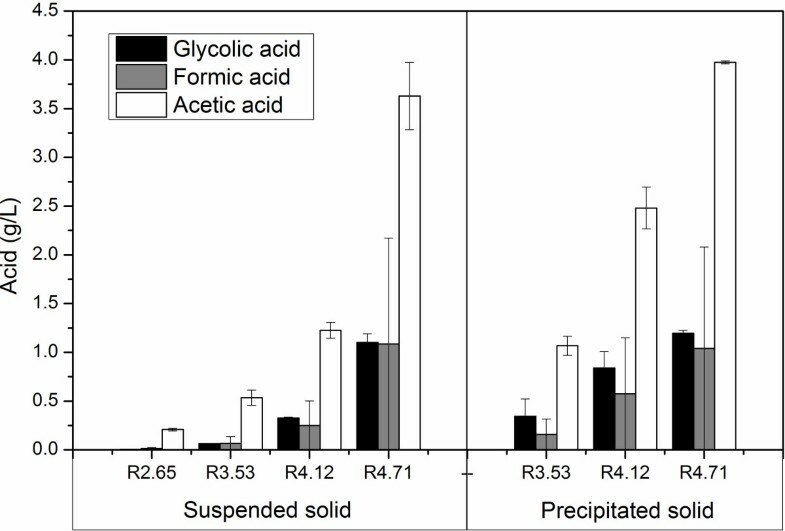 Compared to the acetic acid, the concentrations of formic and glycolic acid were much less, not more than 1.5 g/L. The toxic effect of aliphatic acid on Saccharomyces cerevisiae is attributed to the undissociated form. Formic acid (pKa = 3.75) has a higher toxic effect than glycolic acid (pKa = 3.90) and acetic acid (4.76). However, inhibition of yeast was found to be apparent at their concentrations exceeding 100 mM and lower concentrations than 100 mM gave higher ethanol yields than fermentations with no aliphatic acids included . In this work, the aliphatic acids produced during LHW pretreatment were lower than 100 mM, and consequently beneficial for the ethanol yield rather than harmful. Organic acids formed in LHW pretreatment. An optimal pretreatment condition is needed to consider the use of cellulose, hemicellulose and lignin at the same time. However, if these components require different pretreatment conditions, there is no choice but to emphasize the main component. For example, cellulose was gained more attention in the present study. Under this pretreatment condition, a better cellulose enzymatic hydrolysis performance can be obtained, but part of hemicellulose and cellulose was degraded to furfural and HMF. The SSF was carried out on the LWH pretreated Miscanthus and the untreated was used as reference. The ethanol concentrations were presented in Figures 5 and 6. The ethanol conversion was calculated based on Eq. (2). The ethanol conversion ratio for both the suspended and the precipitated part of Miscanthus gradually increased as PS increased. However, a lower PS was not distinct in improving the ethanol conversion. In the pretreatment on the suspended part with PS at 2.65, there was almost no appearance change found for the samples before and after pretreatment. The ethanol concentration from the pretreated suspended part and the untreated was 7.42 ± 1.45 g/L and 7.73 ± 0.21 g/L, respectively. The One-tailed Two Independent Samples Student's t-Test was used to compare these two results. The P value was 0.815. This indicates that there was no significant difference between the two results within the 95% confidence interval. Therefore, the PS of 2.65 was not utilized in the subsequent pretreatment on the precipitated part. For the suspended part with PS at 3.53, the ethanol conversion only increased by 13.7% compared to that from the raw suspended without pretreatment. When PS was increased to 4.12, the ethanol conversion improved dramatically and reached 84.87%. The highest ethanol conversion was found to be 98.27% as PS was at 4.71. This indicates that PS needs to be above some critical point for this Miscanthus feedstock to improve the biomass conversion effectively. In addition, such a higher conversion also showed that there were no toxic compounds produced in the SSF process. The similar trend of the ethanol conversion was observed on the precipitated part. 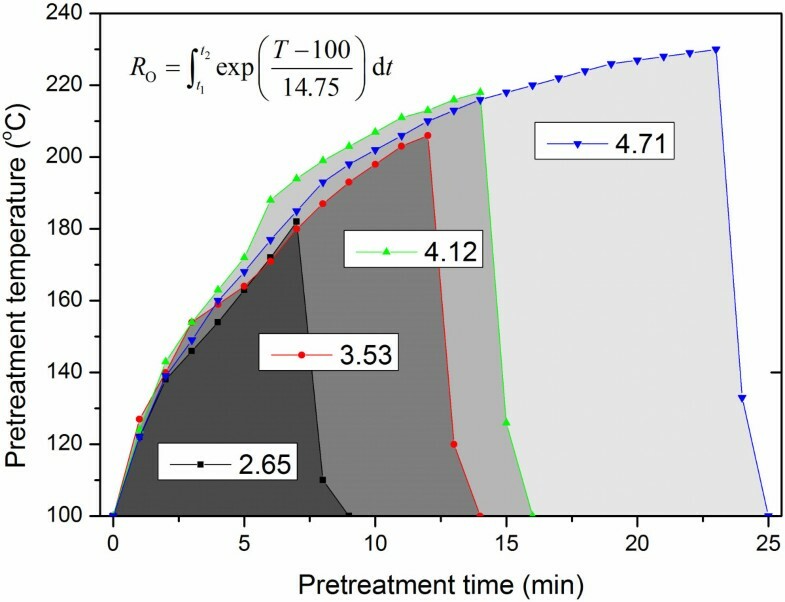 With PS of 4.12, the ethanol conversion of the precipitated (89.86%) was more than three times compared to that from the raw precipitated part (26.34%). SSF on suspended solid of Miscanthus with LHW pretreatment. SSF on precipitated solid of Miscanthus with LHW pretreatment. At PS of 4.71, the ethanol conversion with the two parts separated by washing the raw Miscanthus showed almost no difference. However, at PS 4.12, the precipitated part had a better performance. Which implied that submerging the Miscanthus into water completely during LHW pretreatment maybe reduce the required energy consumption by using a lower PS in the Miscanthus biorefinery. The ethanol conversions from the suspended and precipitated under PS of 4.71 are listed in Table 2. Based on Eq. (3), the ethanol conversion from Miscanthus pretreated with LHW was 14.72 g/100 g feedstock, more than twice higher than that from the untreated Miscanthus (7.12 g/100 g feedstock). Based on the PS of 4.71, Figure 7 gave a mass balance analysis of Miscanthus with LHW pretreatment and SSF. Table 3 lists the ethanol conversions from all kinds of biomass with different pretreatment methods. Compared with other investigations on Miscanthus pretreated by AFEX, ozone, etc., the present study gave a higher ethanol conversion. We also noted that the cellulase dosage loading used in this work was higher than some new reports . It is maybe related to the fibers hornification due to sample drying. Hornification will lead to the collapse of the pores formed during pretreatment and affect the saccharification of pretreated samples [55, 56]. Appropriate sample preparation is likely to reduce cellulase loading significantly. This indicates the LHW pretreatment is promising in pretreating Miscanthus to improve its conversion ratio efficiently. Mass balance analysis of Miscanthus LHW pretreatment and SSF process. The feasibility of LHW pretreated Miscanthus used as ethanol production by SSF was studied. The result shows that a PS of 4.71 in LHW process could completely degrade the hemicellulose in Miscanthus. 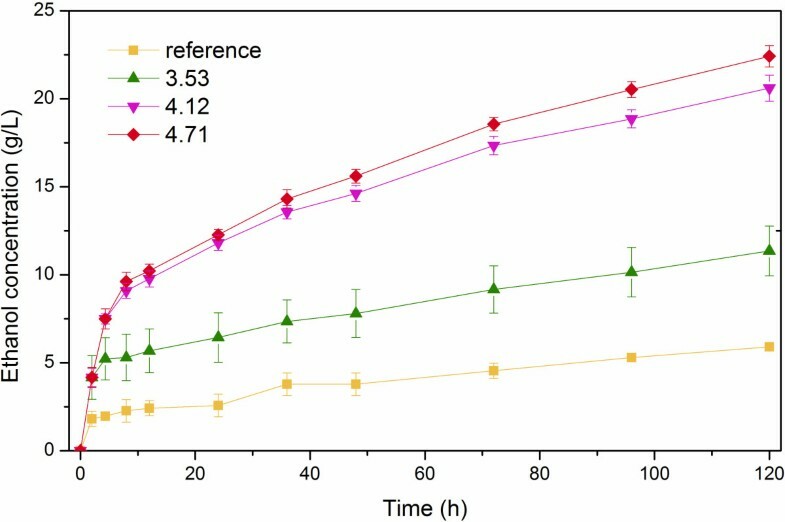 Hemicellulose removal improved the enzymatic digestibility of cellulose and obtained a higher ethanol bioconversion ratio of the theoretical. These results indicated that the LHW pretreatment was suitable for Miscanthus feedstock, which offer a promising solution to the biorefinery of this energy crop. The material of Miscanthus lutarioriparious used in this work was harvested in December, 2011 in Honghu County of the Hubei province, China. The air-dried raw material was cut into 1–2 cm and washed off the impurities including soil and sands. The Miscanthus was then divided into two parts according to the density difference: the suspended and the precipitated parts. To study the impact of the raw material density on Miscanthus bioconversion, these two portions were collected separately and used as the parallel raw materials for the subsequent experiments. Sulphuric acid (H2SO4, 98%) was purchased from Beijing Chemical Factory. Glucose, xylose, arabinose, Glycolic acid, formic acid, acetic acid, 5-hydroxymethyl furfural (HMF) and furfural were purchased from Sigma-aldrich, Co., (3050 Spruce Street, St Louis, Missouri 63103, US) as standards in HPLC analysis. t1 is the time at which the reactor temperature reaches 100°C and t 2 is the time at which the reactor temperature drops to 100°C, (min), and T is the reactor temperature (°C). Figure 8 shows the correlation of the PS with the reaction temperature and time. When the pre-set PS was reached, cooling water was passed into the cooling coils. At the same time, the reactor was raised from the salt bath and put into a cooling water bath to rapidly cool the reactor, the water temperature in the reactor reduced to below 80°C within 2 minutes. When the temperature below 80°C, the reactor was opened to remove the pretreated material and end the pretreatment process. The liquid–solid ratio used in this study was 100:15 (V:W), the pre-set PS were 2.65, 3.53, 4.12 and 4.71. The slurry obtained from pretreatment was separated by vacuum filtration to get the hydrolyzed solution and water insoluble solid fraction. Solid was washed with 20-time water and dried at 60°C. The air-dried solid was used in the subsequent SSF. The hydrolysate volume and degradation products content were measured using HPLC. Correlation of pretreatment severity with pretreatment temperature and time. The composition of the pretreated as well as untreated Miscanthus was analyzed following NREL analytical procedures. According to the NREL LAP , a two-step sulfuric acid hydrolysis process was adopted to break down the structural polysaccharides into sugar monomers for quantification by HPLC. The acid-insoluble lignin (Klason lignin) residue was determined gravimetrically by subtracting the ash content from the residual obtained from the acid hydrolysis. All experiments were performed in duplicate, and the average value was calculated and presented. The monosaccharides from sulfuric acid hydrolysis and degradation products in LHW hydrolysate were determined by HPLC (Agilent 1260 Infinity, USA) with Hi-Plex H column (300 × 7.7 mm, Varian, Inc., Shropshire, UK) at 65°C with 5 mM H2SO4 as eluent at a flow rate of 0.6 mL min-1. A refractive index detector (RID) and a diode array detector (DAD) were used in series. The RID was used to determine the contents of glucose, xylose, arabinose, glycolic acid, formic acid and acetic acid. The DAD was used for HMF and furfural with a detection wavelength of 280 nm and a reference wavelength of 360 nm. 0.9: Conversion factor of cellulose to glucose. The work was financially supported by the National Basic Research Program of China (973 Program: 2011CB707401), the National Natural Science Foundation of China (No. 21276259) and the 100 Talents Programme of the Chinese Academy of Sciences. LH analyzed the data. LC-L carried out the pretreatment experiments and analysis. ST completed Miscanthus sample collection and characterization. XJ designed the project, supervised the experiments, interpreted the data and finalized the manuscript. All authors read and approved the final manuscript.